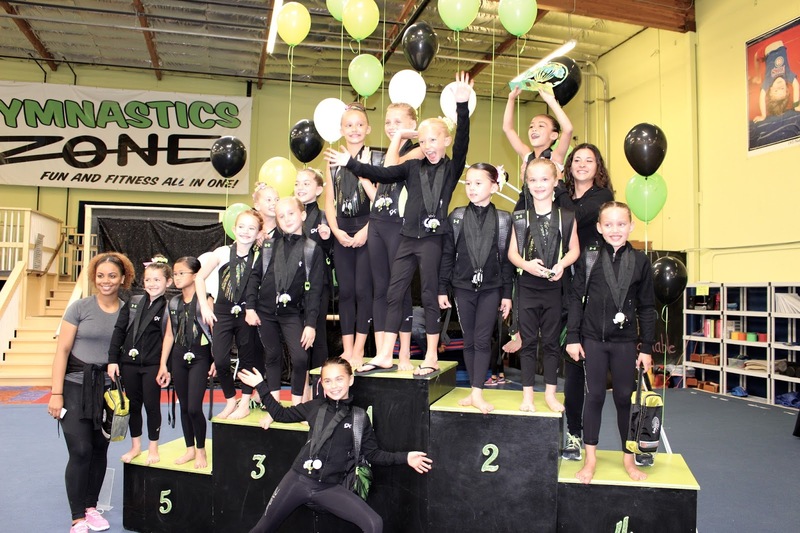 The Junior Olympic compulsory teams from the Gymnastics Zone competed at their homecoming meet last weekend, October 15 and 16 at their home facility here in Napa. The Level 2 girls, the youngest of the team made their competitive debut while the older and more seasoned girls continued their push toward state championships for the season. Zuleihka Smith – first on vault, first on bars, eighth on beam, second on floor and second all-around with a score of 35.825. Maddie Seller – fourth on vault, fourth on bars, third on beam, eighth on floor and fourth all-around with a score of 34.725. Fatima Smith – fourth on vault, seventh on bars, sixth on beam, fifth on floor and sixth all-around with a score of 34.300. Sophia Ambrosini – seventh on vault, ninth on bars, fourth on beam, first on floor and seventh all-around with a score of 34.200. Quinn Renaudin – sixth on vault, eighth on bars and ninth all-around with a score of 33.100. Claire Appleby – ninth on vault, seventh on beam, ninth on floor and tenth all-around with a score of 32.875. Brennecke Daley – eleventh all-around with a score of 31.475. Emma Daniels – twelfth all-around with a score of 30.275. Olive Loose – thirteenth all-around with a score of 30.150. Lily Turner – fourth on vault, fourth on bars, second on beam, third on floor and second all-around with a score of 35.800. Rue Holden – eighth on vault, seventh on bars, third on beam, eighth on floor and sixth all-around with a score of 34.300. Kaitlyn Conway – seventh on vault, fourth on beam, third on floor and seventh all-around with a score of 34.175. Emma Riggs – sixth on vault, eighth on bars, fifth on beam, sixth on floor and eighth all-around with a score of 34.100. Avinlea Bicknel – ninth on vault and tenth all-around with a score of 32.675. Kate Parker –first on vault, first on bars, first on beam, fifth on floor and first all-around with a score of 37.075. Arianna Diebert – sixth on vault, fourth on bars, fourth on beam, second on floor and third all-around with a score of 36.300. Soraya Towey – second on vault, seventh on bars, fourth on beam, ninth on floor and seventh all-around with a score of 35.425. Xochi Huang-Falletti – seventh on vault, seventh on beam and tenth all-around with a score of 32.600. Kira O’Callahan – third on vault, third on bars, second on floor and third all-around with a score of 35.850. Nicole Patterson – eighth on vault, second on bars, third on beam, fifth on floor and fifth all-around with a score of 35.525. Teegan Sigourney – fourth on vault, ninth on bars, fifth on beam, eighth on floor and sixth all-around with a score of 35.225. Stella Sebastiani – sixth on vault, seventh on bars, seventh on beam and eighth all-around with a score of 34.875. Kaylee Costella – third on vault, fourth on bars, third on beam and fifth all-around with a score of 35.225. The level 3 team won the second place trophy with a score of 110.050. Isabella Moore – fourth on vault, fifth on beam and tenth all-around with a score of 34.450. Kailea Abernathy – seventh on vault, eighth on beam and eleventh all-around with a score of 34.200. Makenzie Madsen – first on vault, second on bars, eighth on beam, first on floor and first all-around with a score of 37.075. Coralea Wright – sixth on vault, sixth on bars, sixth on beam, seventh on floor and sixth all-around with a score of 35.675. Brynna Cohee – third on vault, ninth on bars, fourth on beam, eighth on floor and seventh all-around with a score of 35.625. Sade Muessel – first on vault, second on bars, seventh on beam, second on floor and first all-around with a score of 36.425. Tessa Taylor – second on vault, ninth on bars and ninth all-around with a score of 34.100. Mia Sellick – first on vault, fourth on bars, ninth on beam, sixth on floor and first all-around with a score of 35.525. Samantha Willingham – third on vault, fourth on bars, ninth on beam, ninth on floor and eighth all-around with a score of 34.475. The Level 4 team was awarded the second place trophy with a score of 110.175. Audrey Jonas – fifth on vault, ninth on bars, fifth on beam, sixth on floor and sixth all-around with a score of 35.375. Naomi Uemura – eighth on vault, fifth on bars, third on beam, eighth on floor and seventh all-around with a score of 35.075. Tatum McKinley – ninth on vault, fifth on bars, fourth on beam, seventh on floor and eighth all-around with a score of 35.050. Fallon Abernathy – fifth on vault, second on bars, second on beam, third on floor and second all-around with a score of 36.725. Emily Tran – first on vault, eighth on bars, seventh on beam, fourth on floor and fourth all-around with a score of 35.850. Morgan Phipps – third on vault, second on bars, second on beam, second on floor and third all-around with a score of 36.325. Kylie Holman – ninth on vault, sixth on bars, third on beam, fifth on floor and sixth all-around with a score of 36.000. Alexa Rendon – third on vault, ninth on bars, sixth on beam and ninth all-around with a score of 34.550. Hali Chaykin – second on vault, first on bars, fifth on beam, fourth on floor and second all-around with a score of 36.025. Alex Westfall – fifth on vault, fourth on beam and ninth all-around with a score of 33.650. The Level 5 team was awarded the third place trophy with a score of 109.575. All four teams will compete again this weekend at The Disco-Tech Invitational hosted by Technique Gymnastics in Rancho Cordova.